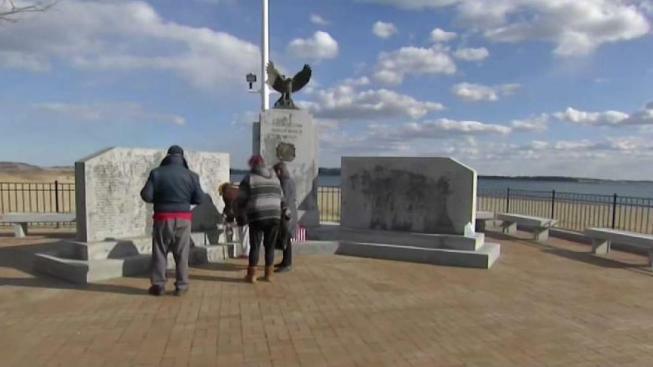 The search is on for a vandal who defaced a World War II memorial with what is believed to be oil over the weekend in South Boston. State police received a call of the vandalism at about 11:30 a.m. on Monday and found an unknown substance splashed onto the memorial stones. Officials believe oil may have been poured over the site. More than 200 names are listed on the memorial, which is located near the causeway heading to Castle Island. The site honors veterans from Dorchester and South Boston who served in World War II. "This is a generation that put on a uniform and went overseas to fight Nazi Germany, to fight for our way of life," state Rep. David Biele said. "And to have their memory desecrated this way is just unacceptable." 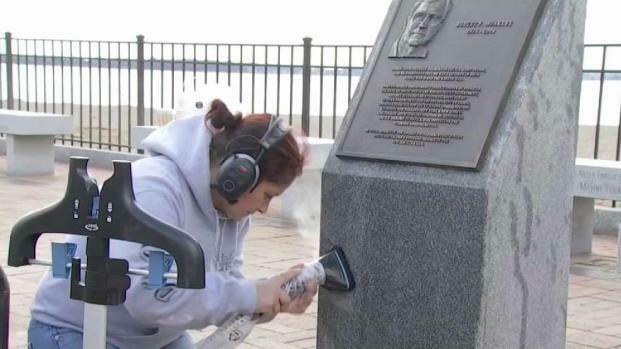 The Department of Conservation and Recreation, along with the Massachusetts Port Authority and a few locals, attempted to clean the vandalism with soap. Corey Morrissey-Scott was among one of the many residents who were disappointed with the crime. His father is honored at the site. "I know he'd be heartbroken," he said. "What would possess someone to do this to a World War II memorial, to any memorial, it's just evil."